Ilhéus ([iˈʎɛws]) is a major city located in the southern coastal region of Bahia, Brazil, 211 km south of Salvador, the state's capital. The city was founded in 1534 as Vila de São Jorge dos Ilhéus and is known as one of the most important tourism centers of the northeast of Brazil. Ilhéus has approximately 222,000 inhabitants, with an area of 1850 km sq, and its downtown is located 1 km away from the Atlantic Ocean. Once one of the biggest exporters of cocoa beans, the city depends almost entirely on tourism. The city's economy is based mainly on tourism, as a result of its beaches and cultural heritage that includes early Portuguese buildings, history and culinary distinctions, which bring to the city many Brazilian and foreign tourists. Ilhéus is the hometown of Jorge Amado, the best known and most popular writer in Brazil. He wrote over 25 novels, which were translated into 48 languages and stayed on bestseller lists in 52 countries. His novels like Gabriela, Clove and Cinnamon and Dona Flor and Her Two Husbands portray life and customs in the Northeastern region of Brazil. The plots of these and his other major works largely treat the lives of poor urban and rural black and mulatto communities of Bahia, as well as the land wars that raged in Ilhéus, where cocoa barons killed each other for power and cocoa plantations. The municipality contains a small part of the 23,262 hectares (57,480 acres) Una Wildlife Refuge, which surrounds the Una Biological Reserve in the neighboring municipality of Una. It contains 15% of the 9,275 hectares (22,920 acres) Serra do Conduru State Park, created in 1997. It contains part of the 157,745 hectares (389,800 acres) Lagoa Encantada e Rio Almada Environmental Protection Area, created in 1993. The APA is threatened by water pollution from sewage and garbage, since most of the communities have no sanitation. There are irregular settlements of squatters in the coastal area. Other threats include irregular fishing, deforestation, fires, hunting and the illegal trade in wild animals. Mixing a strip of coconut trees with rich vegetation of native Atlantic Forest, running parallel to the beach for many kilometers there is the Almada River. There visitors will find standardized stalls and a very long bicycle lane. It is a good place for swimming, walking, surfing, and fishing. It is a beach, with coconut trees, clear sands, and calm waters. The infrastructure on the beach includes stalls and lodges located in the local fishermen’s village. Centrally located, its main attractions are on the seashore, where many facilities have been built, such as multiple-activity sports courts, a bike lane, a band shell, and the Luís Eduardo Magalhães Conventions Center. As its very name indicates, there is a statue of the Redeeming Christ on this very popular beach for tourists. Its waters are recommended for various water sports, such as kayaking, jet-skiing, and Hobie Cat sailing. A small-sized beach, with a total width of only 100 meters (about 330 feet). 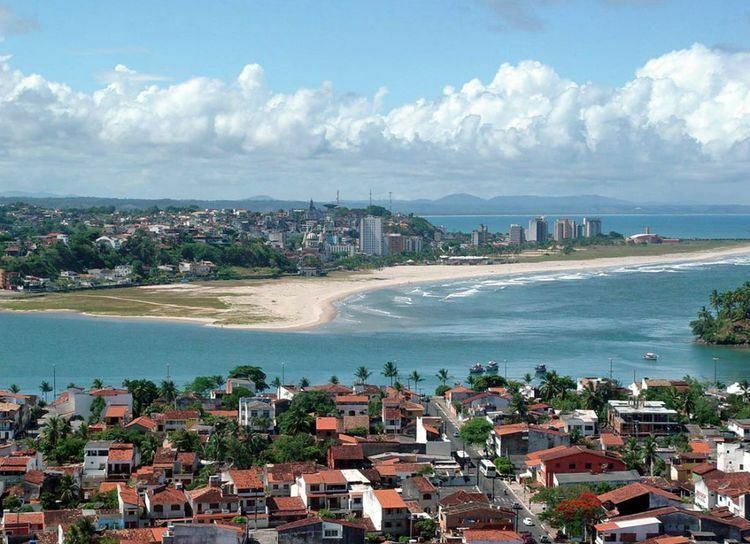 From there, tourists have a good view of the Baía do Pontal (End Beach) and of the Avenida Beach (Beach of the Avenue). Located at the base of Pernambuco Hill, it still has areas of native vegetation mixed with many coconut trees. Its waters are calm, ideal for swimming. Having as its main characteristic a thick field of coconut trees and traces of the native Atlantic Forest, this urban beach is one of the busies beaches in the city. Along its whole length tourists will find a great number of food stalls, most of which specialize in the typical dishes of the state of Bahia. In the sea, there are stretches of reefs and natural swimming pools with sandy bottoms. Its name is a direct consequence of the fact that it was formerly the beach of choice of the rich cocoa “colonels” (local farm owners, caudillos). Today, it is the most desired beach on the south coast, by swimmers and tourists alike, who love its very long strip of sand bordered by a row of coconut trees. Its infrastructure includes a camping site, several standardized stalls, showers, and rest rooms. A rich beach in number of growths of mangroves, it also has rental huts and kayaks. It also has great historical importance, because it was the stage of a fierce battle in 1559, which destroyed almost completely the village of the Brazilian Indians. The first beach of the Olivença district, the Back Door beach is characterized by its enormous waves. Because of this, the beach has become the beach of choice for the most important surfing championships held in the state of Bahia. Its landscape is a mix of vast areas of coconut trees and many reefs. It is a very busy beach, much appreciated by surfers. There are several adjacent restaurants specializing in seafood. There is also a good camping site, with all the usual facilities. With well equipped stalls, many swimming areas of clear still water, this beach is perfect for the enjoyment of families. It is located within the zone of the settlement with the same name, and contains many summer vacation houses as well. One of the favorite beaches for vacationers, on the beach there are countless rental houses and cottages. Its landscape is a mix of coconut tree fields, coral reefs, and large resorts. This beach has a very special landscape, with a mix of sandbank vegetation and a beautiful spread of coconut trees. In Acuípe, tourists will find several hotels and lodges offering visitors an excellent infrastructure. The beach is good for walking, sea bathing, and reel fishing. The estate was bought by Colonel João Amado, father of Jorge Amado, the most famous writer of the state of Bahia. There, the Colonel built his large beautiful house, with spacious lounges decorated in jacaranda wood and Carrara marble. Its construction started at the beginning of the 1920s, and was finished in 1926. The famous writer spent part of his life here. The house has also been used as the headquarters of the Clube dos Bancários (Club of the Bank Employees), and of the Faculdade de Direito de Ilhéus (Ilhéus College of Law). Today, it houses the Fundação Cultural de Ilhéus (Ilhéus Cultural Foundation) and the Casa de Jorge Amado (Jorge Amado’s House). The building is a cultural centre that pays homage to the writer and whose main objective is the advancement of local culture. Jorge Amado de Faria (August 10, 1912 – August 6, 2001) was a Brazilian writer of the Modernist school. He was the best-known of modern Brazilian writers, his work having been translated into some 30 languages and popularized in film, notably Dona Flor and her Two Husbands (Dona Flor e Seus Dois Maridos) in 1978. His work dealt largely with the poor urban black and mulatto communities of Bahia. This church dates back to the end of the seventeenth century, according to the Instituto do Patrimônio Artístico e Cultural do Estado da Bahia – IPAC/BA (Institute of the Artistic and Cultural Patrimony of the State of Bahia). It is located next to the São Jorge de Ilhéus Church. Its collection includes a secular statue of Saint George, sacred documents, valuable items and objects from the sixteenth, seventeenth, and eighteenth centuries, and a panel portraying the history of Ilhéus. The museum is supported by the Metropolitan Curia. Designed by Solomon Silveira, construction began on the cathedral in 1931 and it was dedicated in 1967. It is the seat of the Roman Catholic Diocese of Ilhéus. The Bar Vesúvio (Vesuvius Bar) has been one of the most visited places in the town ever since its creation, at the end of the 1920s, when it was frequented by cocoa farmers who would meet their friends and recount their stories and love conquests. Many visitors and tourists who drop by know it from the Jorge Amado novel Gabriela, Cravo e Canela (Gabriela, Clove and Cinnamon), and who come to savor the famous “Nacib’s kibbeh” – one of dishes most referred to in the novel, in which Mr. Nacib is the owner of the Vesuvius bar, the place where young Gabriela works. At 19 km (11.81 mi.) from the Una Biological Reservation, in a journey that passes by the beautiful beaches of the Southern coast of Ihéus, the Una Ecopark begins in the middle of a rubber plantation where visitors can see the manual extraction of the sap of the rubber tree. Trails in the park take visitors to a suspended footbridge, of some 20 meters (65.62 feet) of height, in the crown of the trees, with a privileged view of the Atlantic Forest. During the ride, often are tourists dazzled with the “visit” of the nice Golden Lion Tamarins. The final prize is a refreshing bath in the waters of the Maruim River. This ride requires its prior scheduling with the Instituto Brasileiro do Meio Ambiente e dos Recursos Naturais Renováveis – IBAMA (Brazilian Institute of the Environment and the Renewable Natural Resources). With an immense variety of species of the Atlantic Forest, the Mata da Esperança Park – today the Botanical Garden – represents a place of resistance and preservation of the native fauna and flora of the area. Either form bicycle or on foot, visitors can cover its trails, having a unique possibility of enjoying the wonders kept there, such as the Golden-headed Lion Tamarin. Around the sixteenth century, in the area where today is the Botanical Garden there was the Engenho da Esperança (Esperança Sugar Mill). It is worth paying the place a visit to see its ruins and learn about the histories of the place’s past. The company of a guide to show the ways and guide the hikes is fundamental. In the town’s center, tourists may rent bicycles. With them, the whole ride, which lasts some three hours on foot, is reduced to only one hour. The center is located within the area of Atlantic Forest, in the Centro Educativo da Natureza (Educational Center of the Nature). That center, which serves to both recover and re-introduce species of sloth into its natural habitat, won the 1998 Prêmio Natureza (1998 Nature Prize). The animals of the Centro de Recuperação (Recovery Center) dazzle visitors because of how much they resemble plush animals, and for their friendliness in the contact with humans. During the rides, which last four hours on the average, it is possible to see other species of animals and plants, natural to the Atlantic Forest. To visit the Center, tourists have to schedule the visit in advance, calling the center at +55 73 3214-3014/3016/3013. Road: BR-101 connects it to Itabuna and beyond. with destinations Belo Horizonte-Confins (CNF), Brasília (BSB), Campinas (VCP), Porto Seguro (BPS), Rio de Janeiro-Galeão (GIG), Rio de Janeiro-Santos Dumont (SDU), Salvador (SSA), São Paulo-Congonhas (CGH), São Paulo-Guarulhos (GRU) and Vitória (VIX).